A baby’s teeth begin to form inside the womb before birth, so taking care of yourself during pregnancy is an essential first step to helping your child achieve a lifetime of great oral health. If you are an expectant mother, be sure to eat a healthy, balanced diet that provides all the nutrients your body needs. It is also important to obtain a dental exam, so your dentist can treat any signs of tooth decay or gum disease. Maintaining good oral health for infants and children as they age involves both good home care and professional management by pediatric dentists. 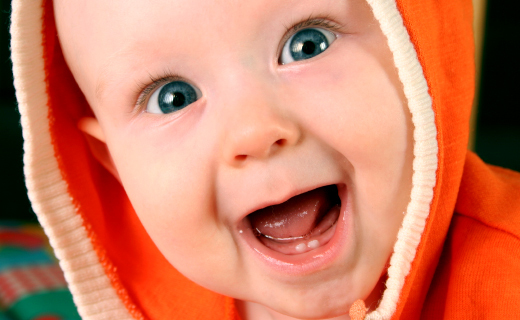 How Teeth Develop The timing of teething varies with each child, but most children’s primary teeth will begin to appear when they are around six months old. By the time your child is three years old, he or she should have a full set of 20 primary teeth. Between ages six and 11, these teeth will be lost, and the permanent adult teeth will erupt. Third molars, also called wisdom teeth, will usually erupt in your child’s late teens or early twenties. When to Visit a Kids’ Dentist When your child is six months old, your doctor should be able to determine if he or she is likely to have future dental problems. Your own dental history and the condition of your teeth and gums can be a strong predictor of your child’s risk. If your pediatrician thinks your child is likely to develop early dental problems, consult a dentist as soon as possible. Most pediatric dentists recommend that your child visit a kids’ specialist no later than his or her first birthday or six months after the appearance of primary teeth. Dental issues caused by disease, injuries, or developmental problems should be addressed sooner. To get the dental care you deserve from an affordable dentist in Atlanta, call today at or make an appointment. Dental One Associates offers affordable family dentistry and gentle, compassionate dental care in Atlanta. With 8 affiliated practices throughout Georgia, our offices are conveniently located with extended hours to meet your needs. At , we provide most dental services, from basic preventative care and general dentistry to specialized procedures and complete dental reconstruction. We accept most dental insurance plans and offer affordable financial solutions for any budget. Patient satisfaction is our top priority and we strive to provide the exceptional, affordable dental care and personal touch that lead to lasting relationships. A smiling patient is our greatest reward and we look forward to keeping those smiles healthy, beautiful, and bright. Discover an affordable dentist who truly cares at .